Would you rather learn in a structured, classroom environment that provides black-and-white answers, or in an informal environment that encourages experiential learning and self-discovered solutions? While different people prefer different learning environments, many will choose the latter option. Because there’s a considerable amount of individuals who favor an informal atmosphere of learning, employers would do well to investigate ways to create casual learning structures in the workplace. Informal learning is defined as “learning that takes place independently from instructor-led classes or course-specific work.” In other words, informal learning happens outside the workplace classroom, and formal learning takes place inside the classroom or training center. While traditional learning is valuable and needed, informal learning should also be cultivated within an organization. Why is it that some employees prefer informal learning models? One reason is informal learning structures make it is easy for people to access work-related information. The content of informal learning is easy to share and adapts well to mobile devices like smart phones and tablets. Indeed, “A well-developed informal learning program provides information to learners anytime, anywhere.” Employees love the ease of information access that informal learning structures provide. Informal learning is not only beneficial for laid-back learners; it also causes growth and acquisition of new skills in employees who prefer formal learning. The presence of formal AND informal learning structures in the workplace creates well-rounded employees who are able to learn in many different contexts. Have you as a business owner struggled to implement informal learning structures? Would you like to successfully create a business model that features peer-led learning? Do you want to empower your employees to be more self-motivated? If so, consider the following suggestions. Facilitate openness: Providing common meeting spaces for your employees is the first step in creating an informal learning environment. These areas should encourage communication and set individuals at ease. Employers might want to consider offering both a physical and a technological (on the cloud) meeting space to their employees. Encourage leadership: Leadership is an important aspect of an informal learning structure. Business owners can either directly assign leadership roles or empower and equip employees to choose their own roles (the latter option lends itself more to an informal learning model). 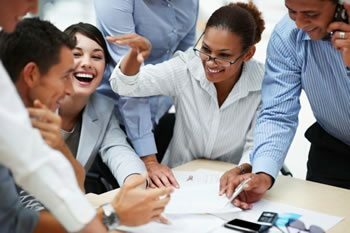 Informal learning environments are fortified when employees take initiative to share their strengths with their peers and naturally gravitate toward the leadership roles that best suit them. Value communication: Business owners who want their organization to host a learning environment that is primarily informal should have a high value for employees with excellent communications skills. Those who are exceptional at communication easily empathize with and affirm others, which builds up informal learning structures and fosters relational connection. Promote action: Informal learning structures should not promote apathy. On the contrary, they should challenge learners to take action. Employers can assist in this process by using prompts and deadlines while an informal learning environment is in the process of creation. However, after such a learning structure is set in place, employees should be expected to take independent action. Implement mobile learning: Mobile learning is informal learning at its finest. Mobile learning (mLearning) allows employees to access training and work-related information via smartphone, tablet or other mobile device. Because of its ease of use and informal structure, mLearning is an important piece of the informal learning puzzle. Every company has the opportunity to make the most of informal learning by setting systems in place that facilitate openness, leadership, communication, action, and mobile learning. However, many organizations fail in these areas. An easy solution to this problem is to implement an LMS that promotes informal learning. It has been said, “80 percent of learning at organizations happens informally.” This statistic should motivate business owners to intentionally set up informal learning structures and create a more casual learning environment in the workplace. These actions will position a business for success.